This quality ice cream scooping freezer is imported from Italy – and when it comes to gelato – we all know Italians know gelato best! Durable and reliable, this freezer maintains a stable temperature to preserve the texture and flavour of your frozen desserts. Clear glass lets customers appreciate your gelato offering. 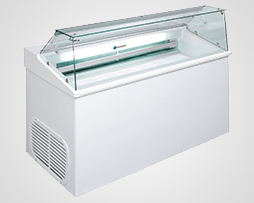 This freezer has a 7 top display capacity, and also comes with ample storage for extra gelato pans for convenience. Get both the best protection and the best presentation for your gelato in one freezer!